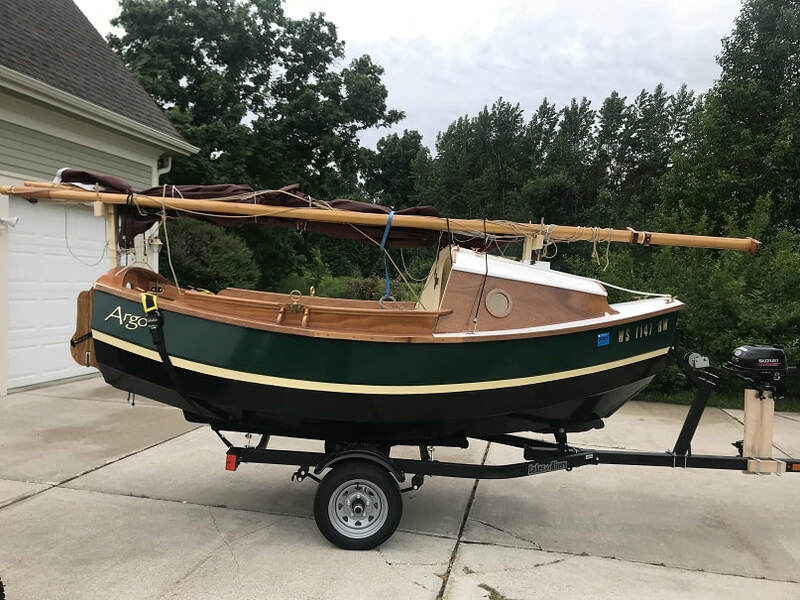 Trailer for the SCAMP Sailboat "ARGO"
I modified a small jon-boat trailer to fit the unique shape of the SCAMP hull. 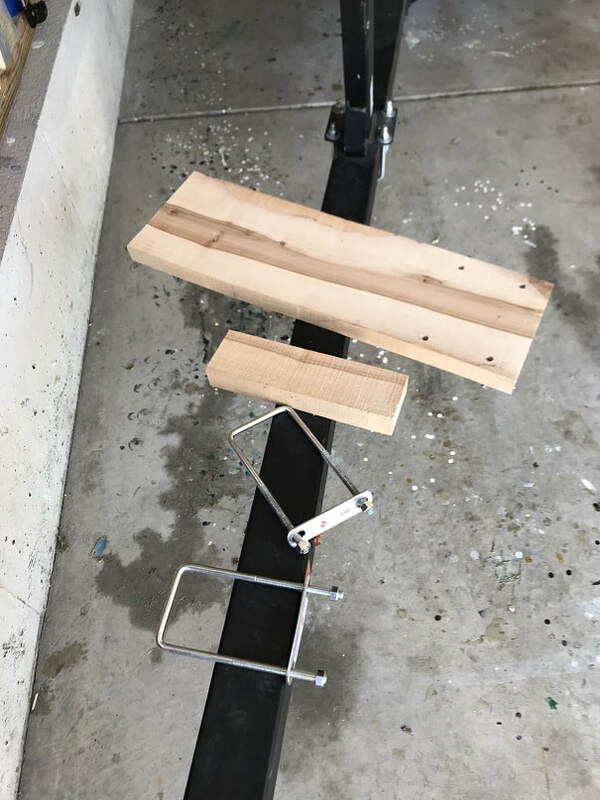 ​The flat skegs would make resting the boat on a solid platform quite easy, and if the platform were big enough, you could even walk around the boat on it. I decided against a solid platform, as I did not like the idea of damp dead air between the platform top and the bottom of the boat. I wanted a more ventilated system, so I stuck with carpeted bunks. 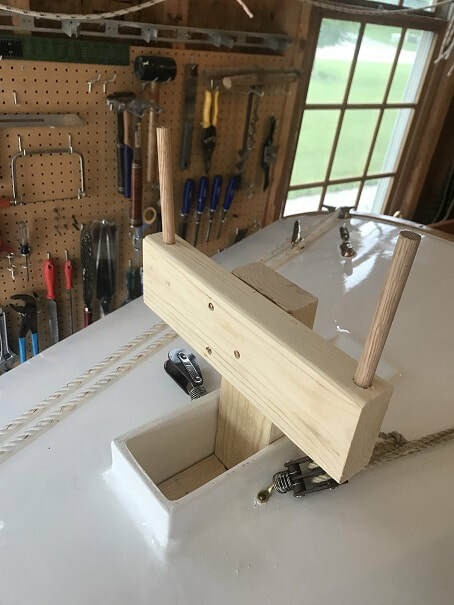 I wanted large surface areas on the bow roller and bottom-support pieces, so I removed the stock urethane rollers and made large flat carpeted support blocks as shown below. 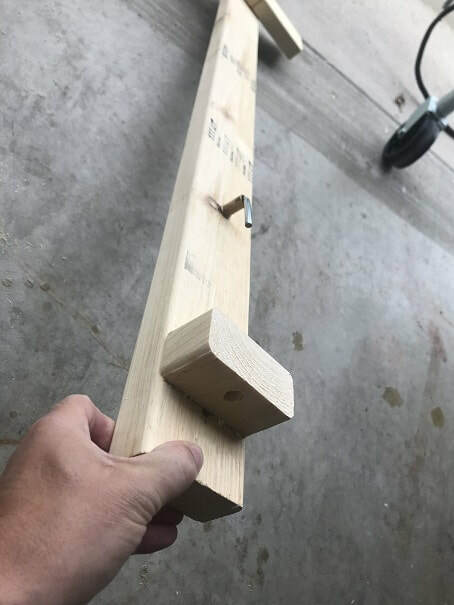 I used scrap 2x6 lumber to build a flat-faced bow support piece to sit flush on the pram bow. 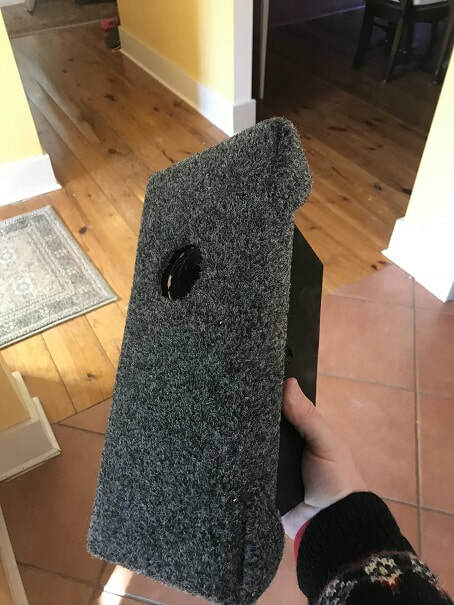 It has a large hole drilled through it, through which the winch strap runs, and it is covered in trailer-bunk-carpet. Two 2x6 cut to this shape and then glued and screwed together. 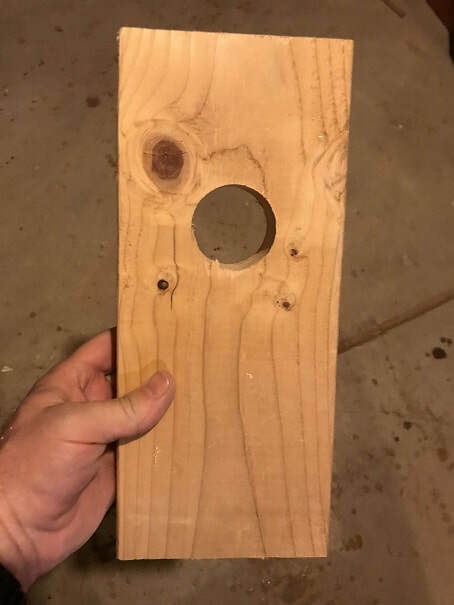 I used a 2" forstner bit to bore a large hole through the piece. 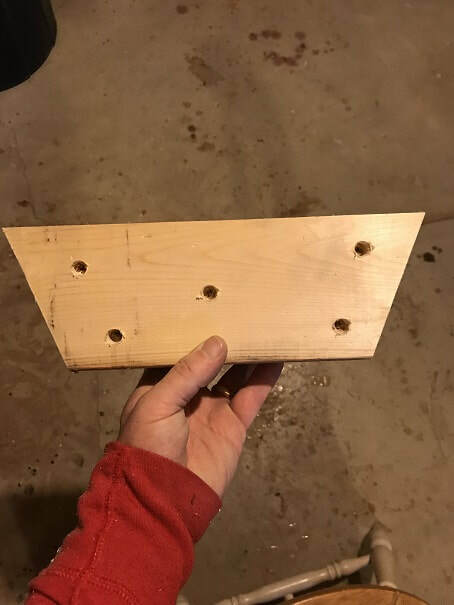 I also drilled a pivot bolt hole which will be used to mount this block to the bow-roller-bracket on the trailer. Be sure to avoid interference between the mounting-bolt hole, and the winch-strap hole. The way my winch, and probably most winches, are set up, is such that the winch-strap hole is located above the pivot bolt hole. 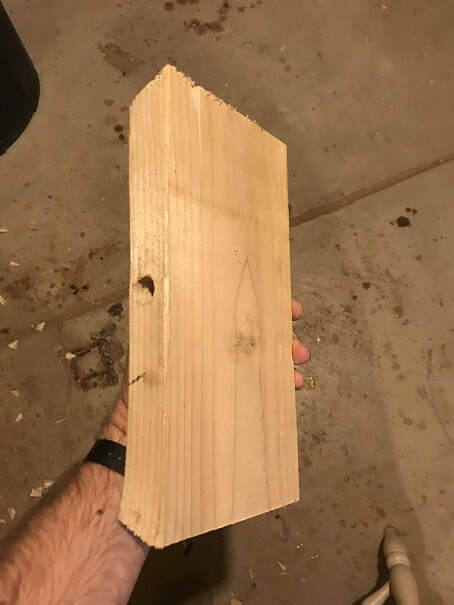 Then I cut another piece of 2x6, 1.5 inches longer then the block above, and bored a 2" hole in it, to align the 2" hole in the support block above. Glued and screwed the face block to the support block, and then painted the whole assembly. 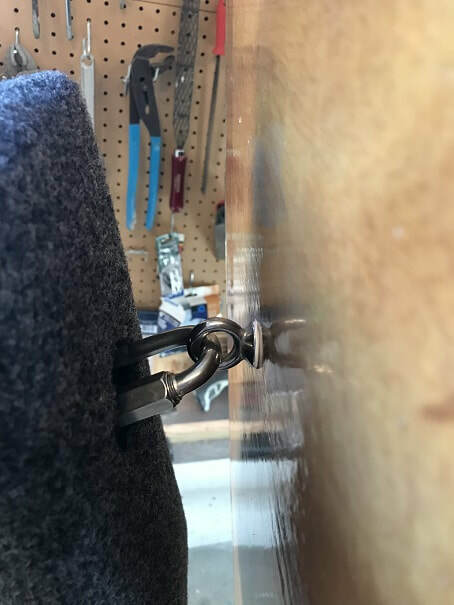 Stapled trailer-bunk-carpet to the bow-support assembly, and cut a hole in the carpet to align with the winch-strap-hole. 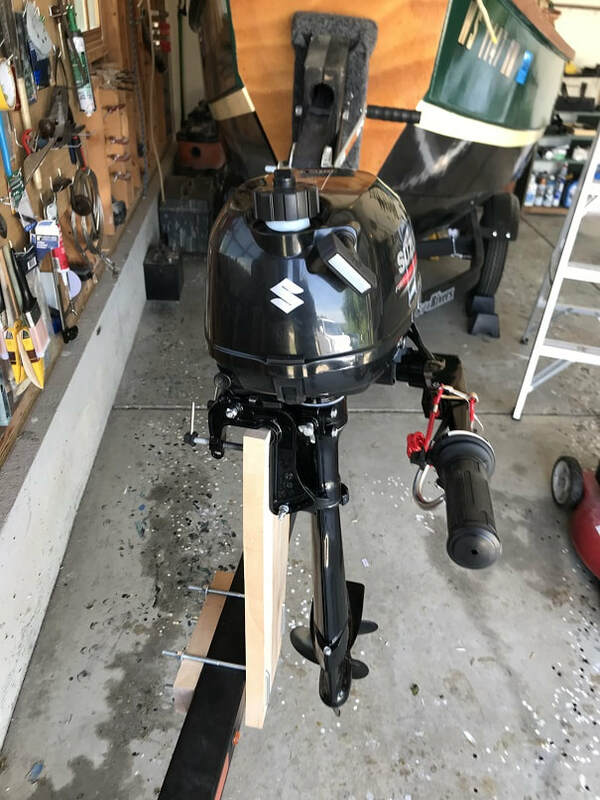 I adjusted the vertical position of the bow-roller/winch on my trailer all the way up to the top of the post. Here you can see the bow-support installed. The winch strap passes through the hole and when tightened, draws the boat up flush to the flat bow support piece. 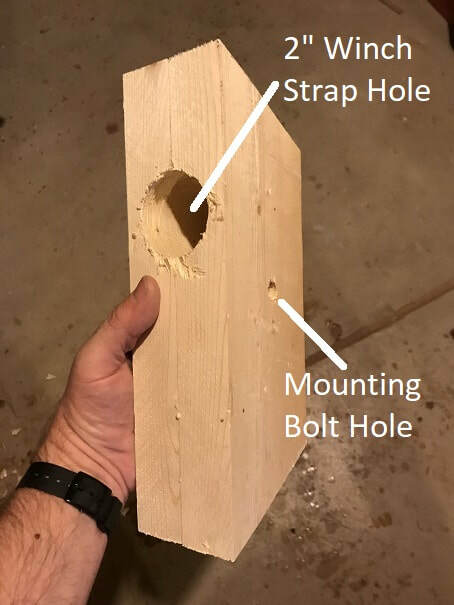 Be sure that your winch hook and bow-eye fit into a 2" hole. The bow support piece is snug but not tight, it can pivot a bit so that is always sits flush against the bow. I replaced the factory winch-strap-hook with a 3/8" stainless steel quick-link which has a working load of 1,540 lbs. This link also works with the fairly small ID of my Wichard Bow Eye. Here you can see the winch strap pulling the boat up to the bow-support piece. 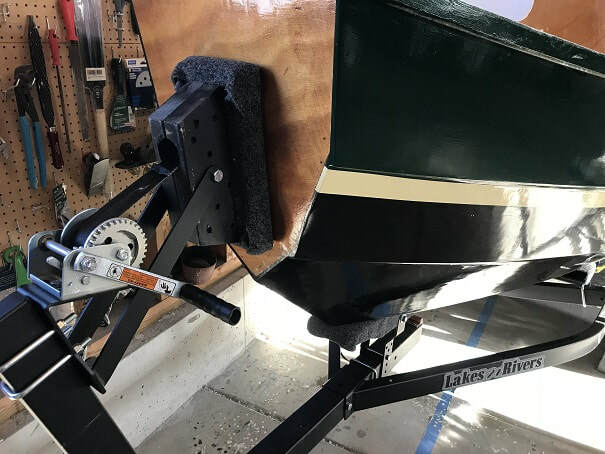 As with the bow-roller, the stock trailer came with a urethane roller in this bracket. I made a large flat carpeted support-piece with a beveled leading edge, and installed it in this location. The original roller can be seen in the photo up at the top of the page. 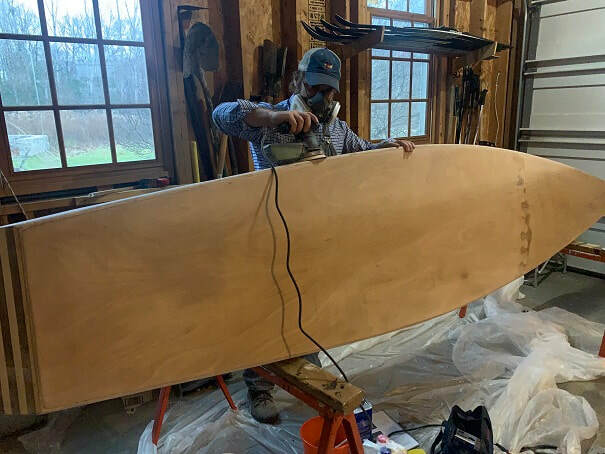 I like a larger surface area to make contact with the plywood bottom, rather then a winged roller. 2x6 cut to length and drilled with a hole to accept the mounting/pivot bolt. I then cut a longer piece of 2x6 and beveled the leading edge so that the bow will ride up on it easier. I glued and screwed the bunk to the support block, and painted the assembly. 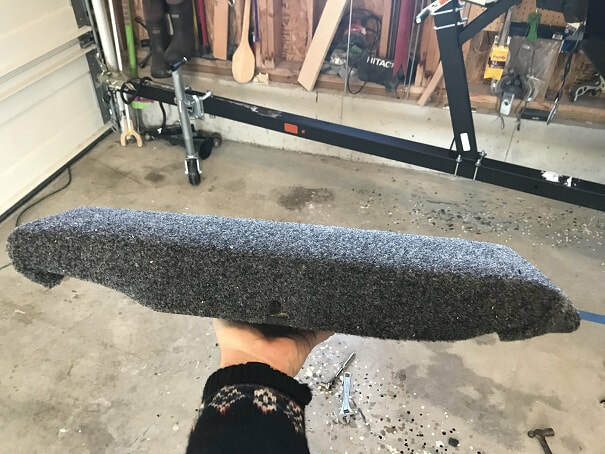 Here is the bow support assembly for the trailer, modified to better fit the SCAMP Hull. The flat pram-bow-support can be seen, along with the bow support bunk below. I adjusted the main bunks to ride OUTSIDE of the skegs. I wanted enough clearance to clear the skeg-fillets, and also leave some wiggle room for loading. In my case, the distance between the inside of the bunks is 28.75", I set the bunks level side to side and front to back. I adjusted the bow-support / winch assembly so that it was 10feet from the back end of the bunks. 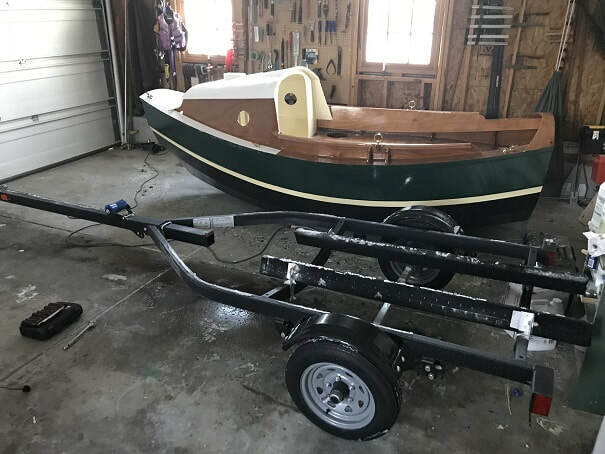 I set the main-bunks on my trailer 28.75" apart (distance between inside edges), but that is based on where I mounted my skegs, so not all SCAMP may be exactly the same there. 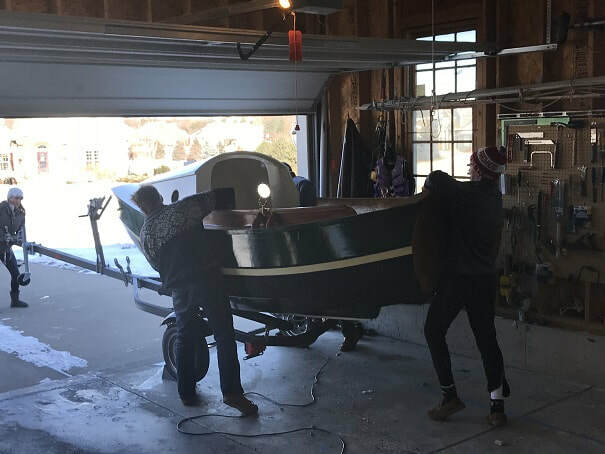 ​​I'd say it is important that the centerboard is firmly supported from below when trailering, rather than relying on the centerboard-uphaul-tackle. 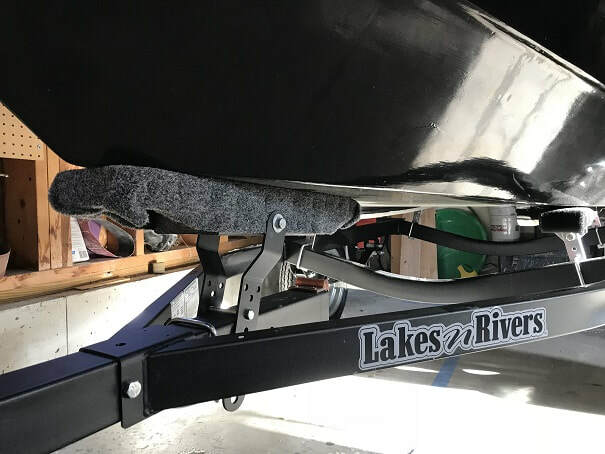 The arrangement I used above, results in the trailer bunk being directly below the centerboard case, so the centerboard rests right on the trailer bunk. 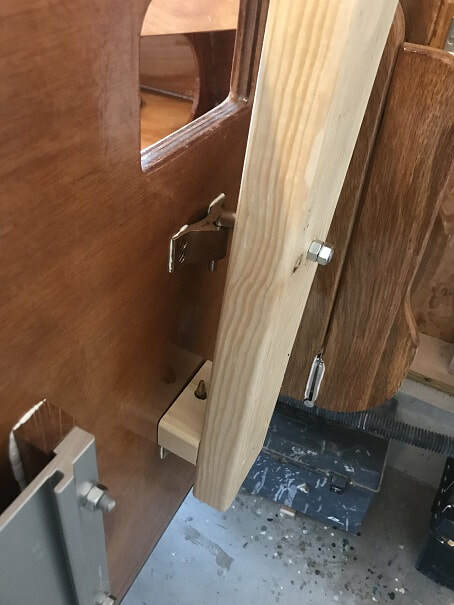 To avoid the weight of the motor bouncing on the transom during transportation, and to provide a convenient long term storage spot, I built the bracket below on the trailer. 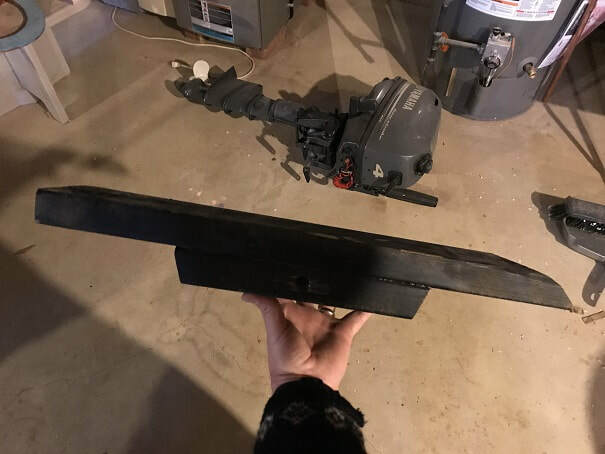 I have used a similar bracket on the trailer of my Compac 16 for years. 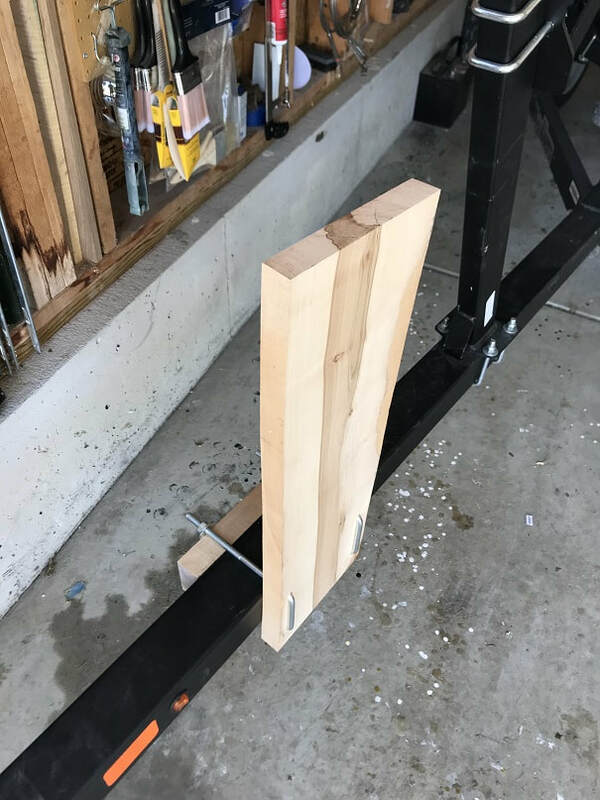 Use U-bolts to avoid drilling through the trailer frame. 1. 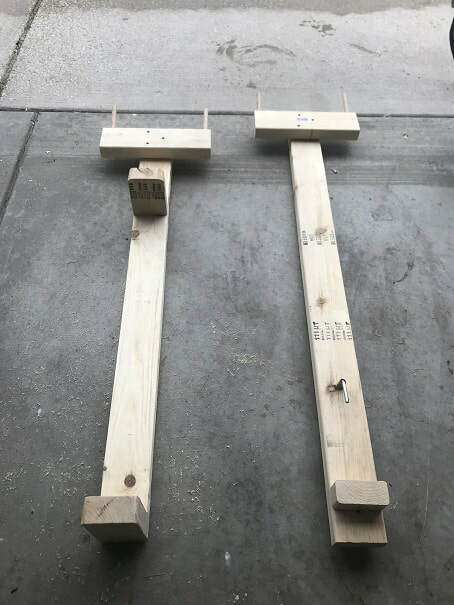 TWO U-Bolts (the gape should match your trailer tube height and the length should be long enough to go through the boards and across the tube) 2. 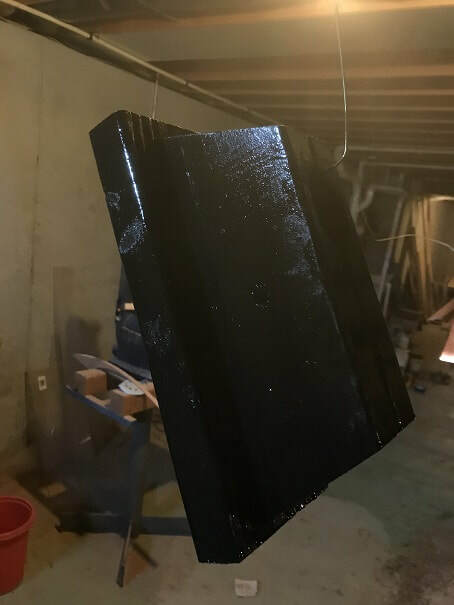 Stout bracket board (On my other boat I used a 2x10, this time I didn't have that but I had some left over 1.25" hardwood, so I used that) Make it as short as possible but long enough to keep good clearance between the skeg and the ground; you will need to measure your motor. 3. I used a backer board for the other side of the tube from the bracket board. Bracket installed with good clearance fore and aft. 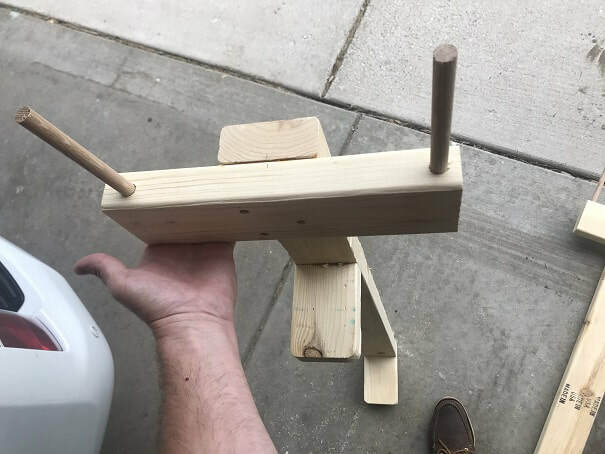 I made these two crutches to hold the mast, boom and yard during trailering and storage. 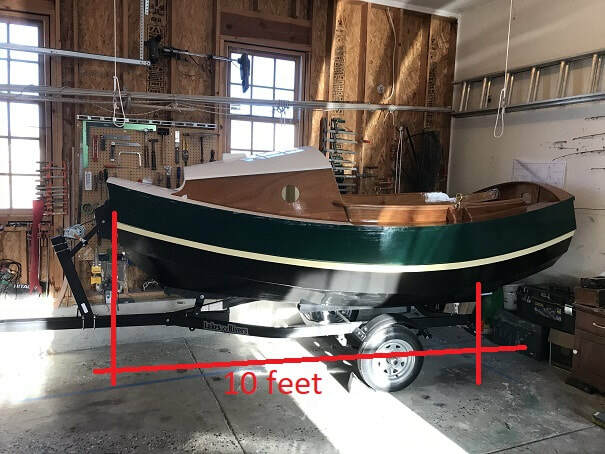 The one on the left fits into the mast-trunk of the boat and the one on the right fits onto the rudder gudgeons on the stern transom. Glued and screwed together. Oak pins serve as cradle posts. 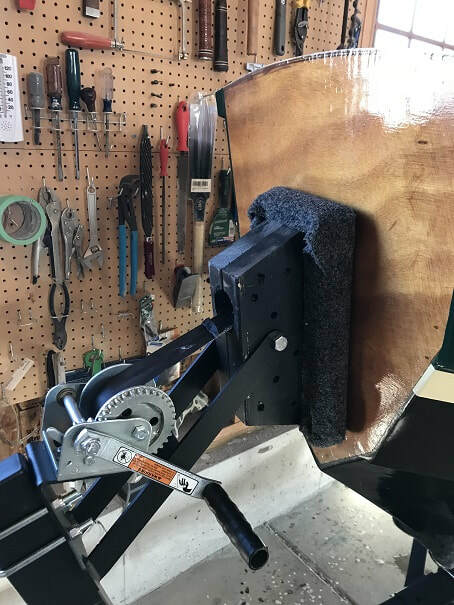 Stern crutch mounts onto rudder hardware on stern.